Retired detective T.J. Peterson is working the table scraps that his former partner, Danny Little, sometimes throws his way. One of them has Peterson hearing from a snitch about a body buried 30 years ago, the same time a drug kingpin went MIA. Peterson is also ducking an ex-con with a grudge, a hitman who likes playing jack-in-the-box with a 12 gauge. Then a former lover re-enters Peterson’s life and begs him to find her daughter, an addict who knows too much about the local drug trade for her own safety. The search for the girl and the truth about the 30-year-old corpse takes Peterson down into the hell of it all, deep into the underworld of crack houses, contract killing, money laundering, and crooked professionals doubling down on their investments of black money. 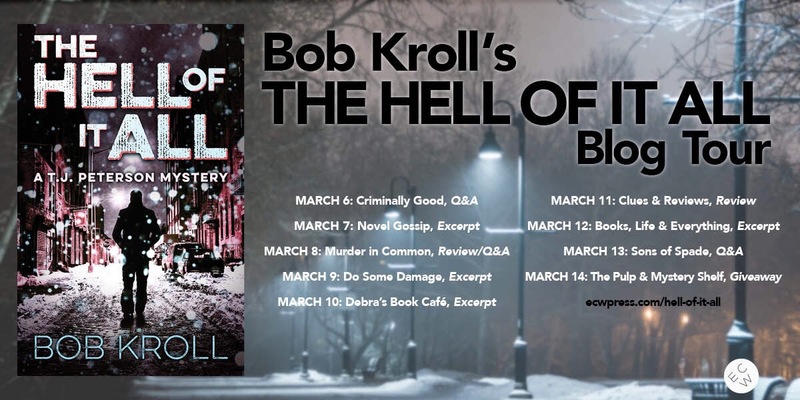 Welcome to my stop on the The Hell of it All blog tour. I have an excerpt to share with you today and the second part of it will be available on Do Some Damage on March 9th. This book sounds great, definitely on my TBR list! Peterson swung the black Jetta onto the shoulder of the narrow coastal road, grabbed the cell phone from the shotgun seat, and caught the call on the fourth ring. “You’re late,” a man’s voice said. The phone went dead, and Peterson gunned it. In the darkness, he missed the snowed-in path to the beach and squealed to a stop. He scowled at his mistake, then popped the transmission into reverse, backed up, and made the turn into the icy snowmobile ruts. Scrub spruce and alders raked both sides of the Jetta. The occasional frost-heaved boulder ground hard against the undercarriage. Peterson heard a snowmobile roar to life not far away. Then the path took a wide turn and abruptly ended in a small clearing surrounded by snow-matted grass. At the far end, a heavy-set man in a black snowmobile suit and black helmet stood beside his machine. Peterson knew him as a low-level criminal with big dreams; the kind who talks speed but cruises twenty clicks under the limit. His name was Harvey Roop, but because of the way he hunched over, as though he were carrying a heavy shell on his back, everyone called him Turtle. Peterson reached for the .38 Ruger in the glove box and climbed from his car. He shoved the gun into the right-hand pocket of his brown field coat. He could taste the salt air in the cold wind off the ocean and looked over to where he heard waves breaking against the rocky shore. In the moonlight, he saw their crests bright with foam and the dark shapes of wild pea and rose bushes poking through the snow. Then Turtle snapped on a heavy-duty flashlight and blasted the beam into Peterson’s eyes. Peterson hollered for him to aim it somewhere else. “I don’t like being here with you,” Turtle said, his voice muffled through the helmet. He crossbeamed the path Peterson had driven down. “You’re the one dressed like Darth Vader,” Peterson said. Turtle shut the flashlight, then leaned over the snowmobile and killed the motor. He removed the helmet and set it on the seat. He worked a wad of gum in his mouth. 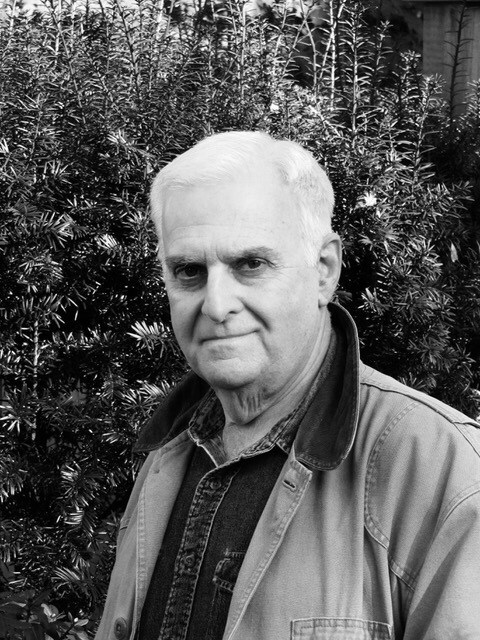 Bob Kroll has been a professional writer for more than 35 years. His work includes books, stage plays, radio dramas, TV documentaries, and historical docu-dramas for museums. 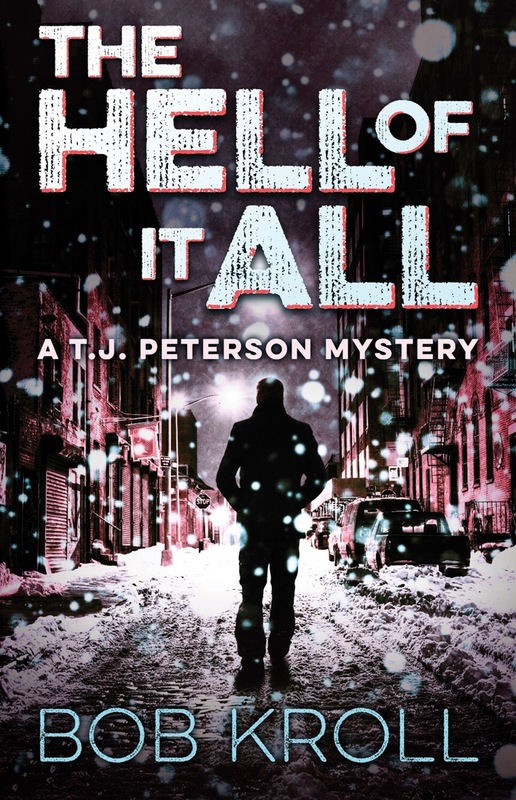 The Hell of It All is the second novel in a projected trilogy featuring T.J. Peterson. Kroll lives in Halifax, Nova Scotia. Visit Bob Kroll’s website to learn more about him.